This spring has already had such an interesting rhythm. A perfect combination of sprinting to get as much done as humanly possible in the span of 24 (or 48 or 72) hours followed by enough rain to give us time to recover. We’re able to keep busy while also able to stay (reasonably) sane which is a bit irregular for spring but absolutely welcome. Plus, the plants are (literally) drinking it all up. There was a short-lived but dramatic hail storm a little over a week ago that really threw us for a loop– shredding our expensive row cover and allowing pesky flea beetles into our young, delicate brassica crops– but overall the weather has been gentle and we’re feeling healthy, balanced and back on schedule after a slow to start season. We may have lost a couple crops due to hail, but that’s a reality we’re reluctantly learning to accept in this whirlwind way of life we’re forging. I’ve been using my free time to do more freelance writing on farmers and the good energy brought to me while chatting and learning more about their stories has been palpable. We’ve also added a small but mighty crew to our days at the farm which is filling our hearts immensely. It’s amazing the joy passionate people bring to our little operation and the peace of mind we find in their hard work, compassion and understanding. I guess it should come as no surprise to me by now, but the good people in our lives continue to be the fuel that gets us through hard weeks. My dad’s respect for our operation has expanded exponentially since we added a tractor and he shows up before he’s asked to help change attachments or mow our fields when our brand new attachments malfunction. And my mother continues to be my rock during the farming season taking every emotional outburst in stride, calmly and rationally looking for silver linings and rays of optimism in hard situations. She races out to help get greenhouse plastic stretched tight on a windy day. She makes phone calls to contractors on our behalf and offers up opinions and knowledge all along the way. She adjusts her own rhythms and routines to accommodate our growing farm business. She yells out to to the fields every couple hours with offers of food she’s just made knowing that our stomachs are always growling. That’s why last week it seemed necessary to take a break from the long days and gentle chaos to prepare some food for her for once. We gathered together on the back deck with an elegant cheese board and some bottles of Strawberry Rhubarb Ale from New Glarus Brewery. The spread was inspired entirely by my mother: a woman who somehow balances being both strong and delicate alongside a bright yet earthy disposition. These flavors are that: a melding of strong cheeses with delicate notes and bright, earthy accents. The cheeses used hardly need an introduction. My mom, a Wisconsin-born, Midwest lover, deserves a cheese board made up of local heavy hitters. 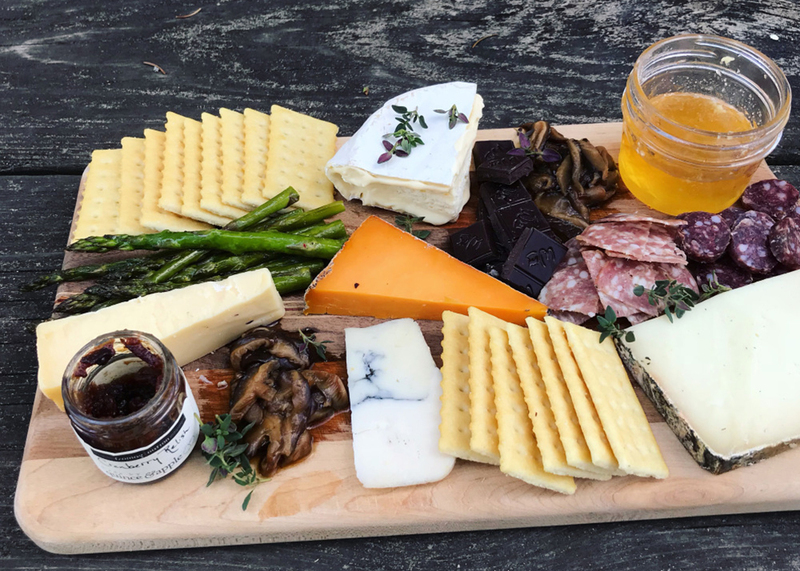 All the cheese on this board, with the exception of the exceptional Bent River Camembert style cheese from Alemar out of Minnesota, are Wisconsin made. Roelli’s Red Rock is one of my favorite local cheeses: a cave-aged cheddar with thin blue veins that bring just enough subtle funk. The Mobay too has been on my list of favorites for years with creamy goat and sheep milk cheeses separated by a thin line of ash leaving you with a perfect balance of bright, tang with sweet, grassiness. The buttery, sweet Big Ed’s Gouda from Saxon Creamery is a crowd pleaser while the Cave Aged Marisa from Carr Valley contrasts beautifully with complex aged notes and an elegant natural rind. The accents to this cheese spread are plentiful. The deep, rich Wm. Chocolate from Haita sits alongside a pile of sweet pickled shittakes (recipe below), a bunch of roasted asparagus, and Underground goat salami with its subtle cinnamon and rosemary flavors. Honey from Hilltop Community Farm and a Quince & Apple cranberry relish (exclusively available at Fromagination in Madison) allow every bite to be tinted with sweetness if desired. I’ve made just enough cheese boards over the last couple years that I’m beginning to find joy in the artful arranging of personalities and flavors– to create boards that can emit feeling and dedicate them to the people I love. This one, I must say, was just perfect for you tough momma. Even in our craziest months, when we don’t have much of our own produce to use regularly, I am so grateful for the local producers who surround me and the great care they take in the goods they create. It’s an honor shopping at the stores that celebrate these visionaries and sharing the things I love with you all. I hope you spend this Mother’s Day with the folks who matter most and I hope you are surrounded by good food that brings forward wonderful memories. ← Alice in Dairyland Visits!